Was the cake a lie? No RX Vega 64 standalone garphics card is available for under $500. Okay, so something huge just crawled out of Overclockers UK’s forums. According to OC UK’s Gibbo (via OC3D), AMD’s launch MSRP of $399 and $499 for the RX Vega 56 and 64 respectively, were only “introductory offers” and an “early adopter” discount by the company. Considering the fact that no one was told of this fact beforehand and that all reviews went live assuming the stated ‘introductory’ MSRPs were permanent, this is incredibly upsetting news. We have reached out to AMD for comment and will update the article as soon as we get a reply. Now the good and bad news, the good news is AMD are rebating early launch sales to allow us to hit £449.99 on the stand alone [RX Vega 64] black card which has no games. This is a launch only price which AMD at present are saying will be withdrawn in the near future, when if it happens is unknown, but remember do not be shocked if the price jumps nearly £100 in a few days. AMD will include a few gaming titles with the re-worked MSRP as compensation, namely Prey and Wolfenstien II, but that hardly makes up for an increase of $130 over the launch MSRP. 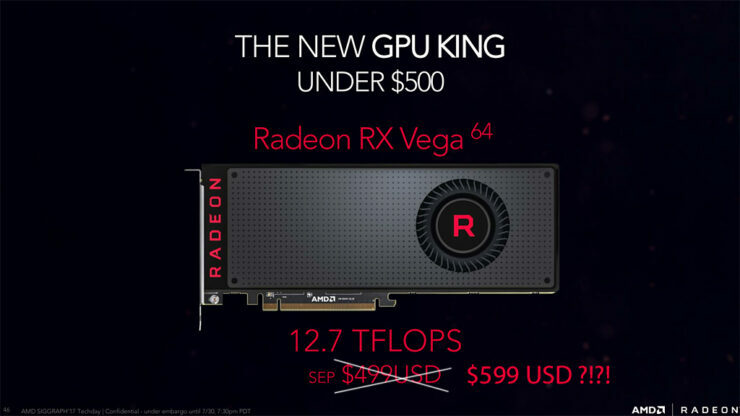 Considering the fact that the first batch of AMD RX Vega GPUs sold out within minutes of the launch, we can safely assume that the first batch allotted to retailers has been exhausted, meaning the new MSRP will kick in soon. The new MSRPs of the air and liquid cooled edition are $599 and $699 respectively. I have to say that I wasn’t expecting this type of anti-consumer behavior from AMD. 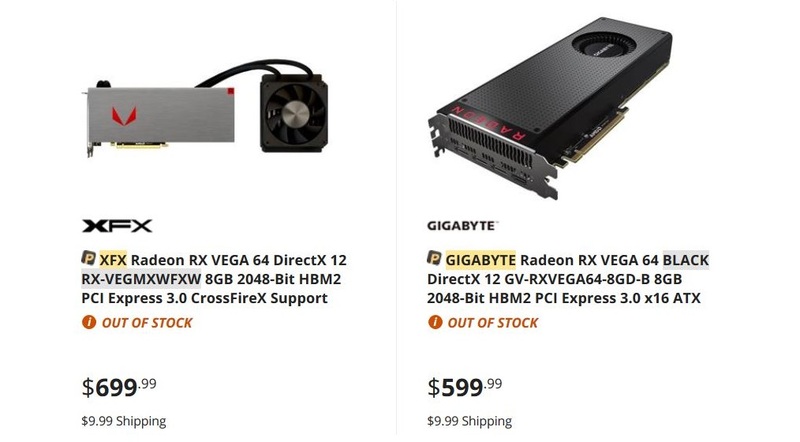 The reason that they are apparently giving is to scare off miners by forcing people to buy ‘Radeon Packs’ but this is something that can be easily solved by limiting standalone GPUs to 1 pc per customer and is basically nothing more than a glorified excuse. 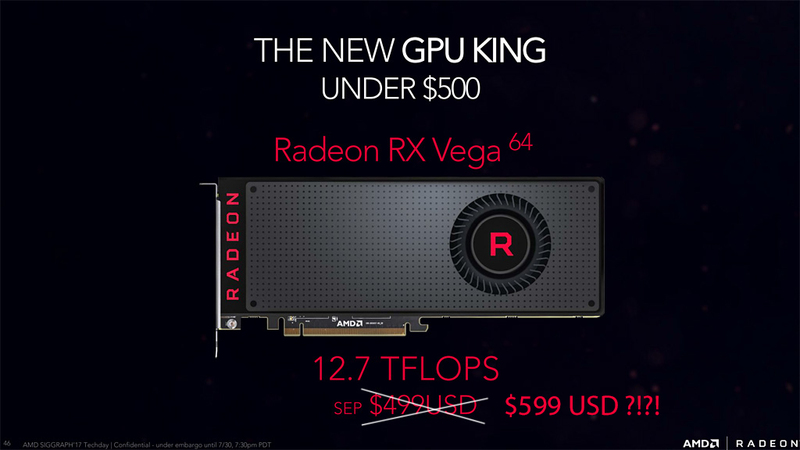 It is an especially low blow because AMD stated that the entire point of the Vega delay was to accumulate stock for launch and yet we saw that their entire inventory evaporated within minutes of launch, making it one of the worst stocked GPU launches in history. Consumers will now pretty much be forced to by Radeon Packs at gunpoint. One thing is for sure however, every reviewer needs to update their conclusions based on the new MSRPs.